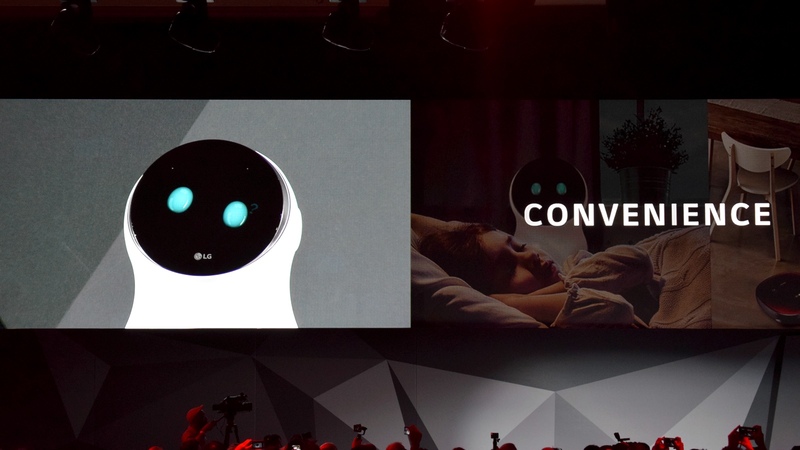 LG has revealed its answer to Google Home and Amazon Echo, and it's a friendly little robot called Hub. The Hub Robot is built to run your smart home, taking to all your various connected appliances - cookers, vacuums etc. In the demo we saw it speaking to other LG devices, so it remains to be seen how well it works with appliances outside of that ecosystem. Hopefully, it will be pretty open. Unlike its rivals, LG's bot has a pair of digital eyes to give it a friendlier face and a bit more personality. In fact, we can't be the only ones to be reminded of EVE from WALL-E. It even turns its face to look at who it's speaking to, making it feel more... alive. The Hub bot also doubles as a speaker, playing all your tunes on demand. We're really intrigued to test out the AI on Hub - LG promises it's going to be pretty adept when it comes to having conversations. Alongside the main Hub Robot there will be smaller node bots that can be placed around the house and communicate with their parent bot and the rest of your network. At CES LG also announced its new smart fridge will come with Alexa built in, meaning you can order groceries through Amazon while perusing your shelves - and making it more efficient than the existing Dash button functionality which has been integrated in previous LG smart devices.